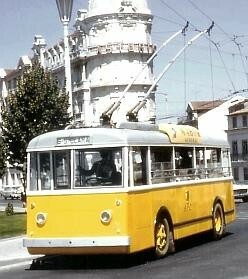 as You must know, in last 16 of August Coimbra's trolleybus system, the first one to operate in Portugal, completed its 60th anniversary. To celebrate the event, and as opportunely related, it is already in production a H0 (1:87) resin model of the first Coimbra trolleybus: the Saurer/Sécheron, model 3TP (1947), from Switzerland, of which only two units had been manufactured, exactly for that city. Of the model, and looking to the event, only 60 pieces will be produced (no one more). It's cost: EUR 45,00 + handling and postage (EUR 3,30 for Portugal and EUR 9,30 for anywhere else, in both cases at priority mail). As the models are yet in production, if you are interested to buy it, please send an ordering e-mail message to secheron.coimbra[at]sapo.pt (*) . However (as we, APETc, cannot do better), You are invited to make a first half payment (EUR 25,00), which details must also be sent by mail to the same address, for the order be proceeded. As soon as the model will be available, the purchaser will be informed by mail, being then requested the upstream remain to proceeds the respective sending. Some of the models should available for dispatch during the second half of the next month to October; the remains would be available only at the end of November. Thus, if You want to be one of the first ones to possess a unit of the first and unique H0 model of a Portuguese trolleybus, don't hesitate! Make just now your order! The payments preferentially must be done by banking transference: in Portugal to the NIB: 003507390001475320047 and in EU to the IBAN: PT50003507390001475320047. PayPal can also be used (and should for outside EU); however in this in case the amount of EUR 1,90 must be added to the value above to pay the payment charges. We request, and equally we remain thankful, the spreading of this message to who is interested for this kind of subject. * to send an email to this address, replace "[at]" by "@". This letter has been posted here for your information only. The author of this website is not responsible for its content. Any queries should be directed to the author of the letter.